Buy Kelvin Mann’s Etching and support the Docklands Arts Fund! After the success of the Docklands Arts Fund Print Commission campaigns in 2015 and 2016, the Docklands Arts Fund is delighted to announce the 2017 edition is made possible by the support of TIO and the South Docks Fund. Artist Kelvin Mann has created an etching in Stoney Road Press. 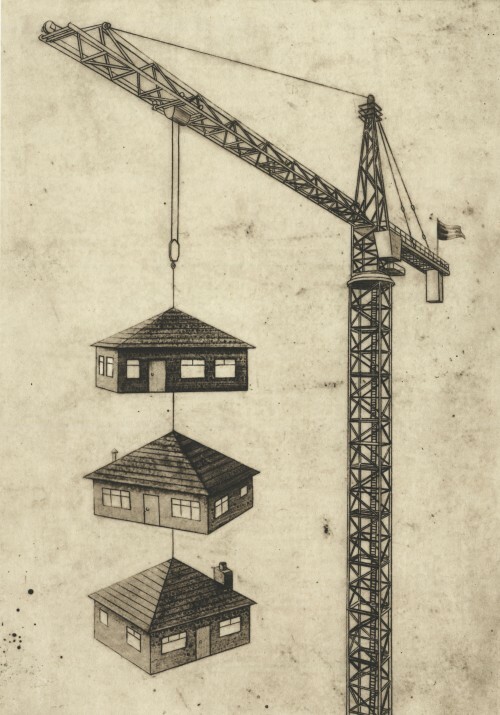 The etching is called ‘Semi Detached High Rise’ and was created using a very old Japanese technique called Chine-collé. All the proceeds of sales will support the Docklands Arts Fund Small Grants Open Call 2018. Last year’s commission, Colin Martin’s Etching ‘Vinyl Factory’ raised over €20,000 towards three new and exciting art projects currently taking place in the Docklands. You can read more about these projects here. You may already be a fan of Kelvin’s work or be familiar with his distinctive style of art. This is your chance to not only buy this iconic print for your home, office, friends or family, but also to support the fund in making more exciting art possible in 2018. Kelvin Mann was born in 1972 in Dunedin, New Zealand. He was educated at the Otago School of Fine Art, NZ. From 1994 – 1996 he was employed as an animation artist by Vidmark Television, NZ. In 1997 he moved to Dublin to become a member of Graphic Studio Dublin. He produces finely etched prints that often incorporate a touch of whimsy and play on word titles. Separate to creating his own artworks, he works at Stoney Road Press as a printer and technician. Kelvin has worked as a printmaker at Stoney Road Press in Dublin since 2002. He has exhibited widely in Ireland, United Kingdom, Australia and New Zealand. From the turn of the century, there has been a dramatic transformation in the Dublin Docklands area, with previously disused buildings and empty lots giving way to construction cranes and new industries in the hope of building a new Ireland. Following the financial crash ten years ago, the Docklands area is once again a symbol of a revitalised country, with cranes constructing the buildings to house a rejuvenated economy, along with apartments and homes. The changing dynamics of industry, our newfound prosperity, and the Irish desire to own a semi-detached home with a “south-facing” aspect have led to questions around the availability of housing and the prospects for future generations to live within local communities. ‘Semi Detached High Rise’ is an intaglio print on 34 gsm Kozo Japanese paper which is then adhered to 410 gsm Somerset paper from England using a technique called chine-collé, roughly translated from French chine, meaning tissue, and collé, meaning glued or pasted. The paper is brushed with wheat starch paste and then run through the press in contact with a dampened piece of heavier paper, resulting in what appears to be a single sheet.